It was dawn and snowing when I stepped back onto the river trail. Snow in October is not unknown in Elmira, even if the natives feign dismay and disbelief each time it appears. I find this particular local affectation endearing. Elmira has thousands of sharp instruments to gauge who belongs, and who doesn’t, yet only this painless social glue. Anyone, even if she plucks chicken feathers all day and lives in Shangri-La, can join Mrs. Crandall in the certainty that snow has never before fallen in October. It’s a little fib that costs no money and very little loss of dignity. It doesn’t even rate as a venial sin. You can go back to Shangri-La holding your head high, become one with the massas every October until the brackish sewer waste posturing as a river freezes over. At which point, you can see the rats trapped under the surface ice, trying to claw their way out, in vain. Round Hill emerged abruptly beyond the river bend, its top swimming in a swirl of snow and low clouds. If McCabe were still standing there, she would be as invisible to me as I to her. I wished that she had stayed out all night, and that she was now frozen, delivering both of us from what would come next. I had returned with her to Elmira in complete confidence, a surgeon with a steady hand and a precise diagnosis. Now the malignancy had metastasized. McCabe was not who she used to be. Or was she? Glorita was back. Bebe, where was Bebe? I prayed for the Tongues of Fire to appear again and cleanse my mind, calling aloud as the snowfall turned into a blizzard, slowing and finally stopping my progress. Somewhere near the bridge I curled inside a hollowed tree trunk. I pulled my sweater over my head, and kept my hands in my pockets, remembering that most body heat is lost through the hands, feet, and head. It was not the first time in my life that I had been caught in a blizzard mid-way between Shangri-La and Round Hill. Glorita and I had spent a tasty hour and a half huddled inside a similar tree one night when we were fifteen. I could feel her warm body next to mine now. “How come you never told me about Glorita?” Bebe said, wedging herself between my left arm and the tree side, her arms crossed over her chest. She was wearing her Sandra Dee sweater, a pink angora confection found at the Salvation Army shop on Fifth Avenue. “I had forgotten about her,” I said, truthfully. Bebe opened her blue eyes a little wider, held them like that for a beat, and then allowed them to slowly retrieve their natural shape. This was her highly skeptical glance, tiny enough to be deniable. I respected the convention. There was a soupçon of cynicism in that glance, signaling to the world that Bebe was awfully smart. She was, but not as much as she, and I, once thought. I reacted to her glance with rear-guard petulance as usual: “I don’t mean ‘forgotten’ in the legal sense. If the FBI questioned me, I would have to confess to having known Glorita, and having been born here. But we can’t conduct our lives like a courtroom drama. We have to allow room for forgetfulness.” Bebe stared at me with her normal eyes, a long time, unblinking. “Are you trying to hypnotize me?” I said with forced cheerfulness, shutting my eyes. When I opened them, I was in bed, in the Judge’s studio, under many blankets. I heard whispers. Someone took my right wrist. I felt a sharp pain. Everything went black again. I came back up in sharp jolts, like an archaic sponge diver. Bleeding from every orifice, vomiting, defecating. Each hole trying to outdo the others in grotesque display. “Is she dying?” someone whispered. “A cloaca,” someone else whispered. When I opened my eyes again, sunshine filled the room. The trees outside were green. Through the half-opened window came a soft breeze smelling of apples and molasses. I was on dry land. A rustle made me turn my head to the right. McCabe was sitting next to the bed in my favorite chair, a small red leather notebook on her bony knees. She was wearing the same jeans and plaid red jacket she had worn on our fishing trip. I shut my eyes again, hoping she would tire and leave. Skeletal McCabe, unlike her chubby predecessor, was so quiet I wondered if she actually breathed. I kept my eyes shut until the soles of my feet hurt as if I were walking on burning coals. It was dusk outside. The room was in shadows. She was still there. “It’s Thursday, November 1,” McCabe said, as if reading my mind. I had been away from this world for a week and a day. McCabe refused to give me a painkiller. Instead, she brought me a vegetable broth and a sliver of bread pudding with a touch of molasses. I drank the broth by myself, shakily holding the hot bowl to my lips. She spoon-fed me the pudding, gently, without even asking. I couldn’t have held the spoon, or found my own mouth. While she was gone with the empty tray, I tried to sit up. I couldn’t. My upper-body muscles shook with the effort. My legs wouldn’t move. Had they been amputated? I fell back on the pillows covered in sweat. McCabe was suddenly standing by the bed. I hadn’t heard her return. She pulled down the starched white sheets that covered me from the chin down. My feet were wrapped in padded bandages snaking up to mid-calf. “Frostbite,” she said. “It will heal.” I did not believe her. Anything can be wrapped to resemble feet. McCabe bent and produced a bedpan from under the bed. She handed it to me, along with a hospital buzzer that must have been installed while I was sleeping. She then left the room, walking noiselessly on her hiking boots, still caked with Wanetka River mud. McCabe had pronounced “frostbite” and “heal” crisply, and fluently, with no trace of her earlier hesitations, or of the raffish Brooklyn accent that Old McCabe affected to better peddle her overpriced gallery merchandise. In McCabe’s newly smaller mouth (how can a mouth shrink? ), which dominated her face in ways Old McCabe’s big mouth never did, the inanimate now became intimate, without ceasing to be inanimate. This is how it must have been between Dr. Mengele and his patients. Or the Tribunal of Faith and the falsely accused true converts. I never asked, and McCabe never told me, how I had gone from the tree trunk in the blizzard to the sickbed. I was grateful for her silence, because I did not want to be grateful to her for my life. I was now a doll for McCabe’s Mary Magdalene to play with, tearing my limbs in subtly different ways each day. Every morning, when McCabe emptied my urine and feces and changed my pre-gangrenous bandages, she would put me on the rack, torn between reason and humiliation, with its black-bile corollary: ressentiment. I did not know then that I was experiencing an overflow of gratitude. Ressentiment is indispensable for the criminal palette, but only in small, controlled doses. This sudden excess, imposed and not chosen, was rotting my insides. I could no longer see myself as a Lizzy Borden. So, each time McCabe left the room, I tried to cleanse myself of the rot. Each time I failed. Sleep helped, once. I prayed for amnesia, McCabe amnesia. I actually said a prayer aloud, both truthful and insincere: “Oh, Lord I am an unbeliever…” it began. Like sleep, the prayer only worked the first time. It was bad enough for my criminal project that a doctor had already seen me four times. He was bald, petulant, and always wore an orange hunter’s jacket with a white fur collar. The first time, I was unconscious. The second time was the day after I woke up, when he congratulated McCabe for her dexterity with bandages, declaring that she would have made an excellent nurse. The third was a week later, on the seventh day of my dismemberment on the rack. The fourth, a week after that, on November 16, my fourteenth day of agony, when ressentiment had sucked me dry, and the doctor, sensing I was more compliant, found me much better. His last phrase hung in the air for the rest of the day. McCabe felt it, and so did I. She broke down first. “We’re going into the woods, not coming out of them. Don’t you think?” she said, glancing out of the window. This was the first time McCabe, Old or New, had asked my opinion about anything in the ten years we had been acquainted. “Depends on which woods,” I croaked, throat tight, uncertain. McCabe was thinking so hard that her face became even paler, her lips bluish, and her eyes bloodshot. She was facing me now, trying to dig out sense from a remote hole, using the philistine brain that she was wearing, courtesy of Old Pig McCabe. Stop! I ordered her with my mind, but Reason prevented me from getting that merciful word out of my mouth, hoping that McCabe would keep her teeth clenched until all oxygen to her brain was cut off and she would drop dead in front of my invalid bed. “The woods of chance,” McCabe finally said, fixing her eyes on mine. “You mean fate, McCabe,” I said, distracted by Reason’s incongruous butcher’s apron. “No, I mean chance,” she said, with a frosty firmness. “The right word is ‘chance’. The woods of chance.” She then did something she had never done before: she sat on the side of my bed. Prudently, midway between my head and my feet. Startled, I let her. I even welcomed her (this I admit to myself only now that I am breathing my own dust to dust.) For an instant, ressentiment and reason flew from my mind, taking the Magdalene with them. I was seeing the New McCabe as if for the first time. She had won the right to sit on my bed. She had forced the mind of a hog to think in a direction other than satiation. Even if Kant’s bones did not lie there, even if the phrase “woods of chance” was infelicitous and un-euphonic, to utter it was a victory for the human spirit. McCabe suddenly looked livelier than she had since our drive to Wanetka Falls, when the sight of the migrating birds had given her the kiss of life, and the eloquence to tell a story that I, in bed now with my feet beginning to throb and burn, had almost forgotten. “The woods of chance,” she repeated, savoring each syllable. Hearing it a third time, slowly spiraling out of her mouth, sent an electric shock up my chilled spine. Was McCabe threatening me? Did she know what I was up to? If she did, she could easily strangle me with her big hands or asphyxiate me with the pillow. I still couldn’t move. I looked at the side of her face. Was she stupid but lucky, as I had always thought, or very clever? Innocent she couldn’t be. No one could. Innocence was Bebe’s kingdom, as imaginary as the one down in Florida. McCabe must have left the room while I choked with fear. She was back now, with her nurse’s tray. She put on a pair of clean latex gloves and began undoing the bandages on my feet. 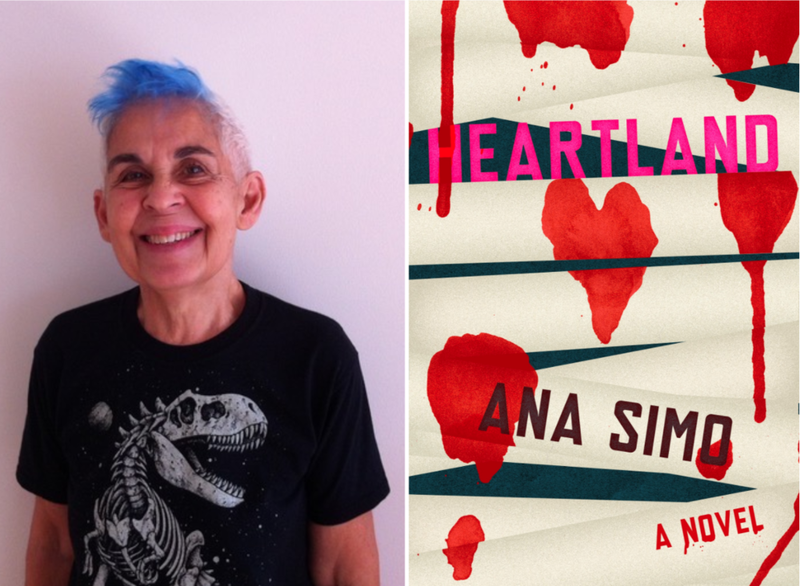 Ana Simo is the author of a dozen plays, a short feature film, and countless articles. A New Yorker most of her life, she was born and raised in Cuba. Forced to leave the island during the political/homophobic witch-hunts of the late 1960s, she first immigrated to France, where she studied with Roland Barthes and participated in early women’s and gay/lesbian rights groups. In New York next, she co-founded Medusa’s Revenge theatre, the direct action group the Lesbian Avengers, the national cable program Dyke TV, and the groundbreaking The Gully online magazine, offering queer views on everything. Heartland is her first novel.